SEC Commissioner V Nagi Reddy flanked by DGP M Mahender Reddy (L) and Chief Secretary SK Joshi (R) at a meeting in Hyderabad on Monday. 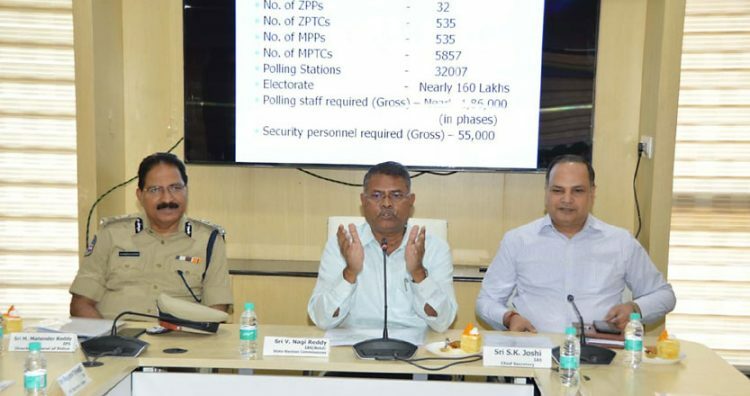 Hyderabad: The State Election Commission (SEC) is likely to issue the notification for Mandal and Zilla Parishad elections between Thursday (April 18) and Saturday (April 20), State Election Commissioner V Nagi Reddy said on Monday. He said all preparations were nearly in place for the elections and a preparatory meeting would be held on April 18 with all District Collectors and Superintendents of Police. The SEC was also in consultation with Maharashtra and Karnataka for deployment of additional security forces to ensure the peaceful conduct of the local body elections. The Telangana government plans to complete the process to elect Mandal and Zilla Parishad territorial committees’ members, who in turn will elect ZP chairpersons, before May 23 — the day results for the Lok Sabha will be announced. The results of the Mandal and Zilla Parishad polls are expected to be announced after the Lok Sabha results. Nagi Reddy said all political parties were provided with copies of electors for the upcoming polls. The details of polling stations would be announced on May 18. Preparations were made for the printing of ballot papers, and with each mandal electing one ZPTC member, there would be one Returning Officer (RO) overseeing the poll process. The RO would also oversee the election of three MPTCs. In all, the SEC estimates that it will require 1.8 lakh personnel for conducting the local body elections. He said the SEC estimates that the polling process would be completed by May 20 and a decision on the number of phases would be taken soon. “We estimate that we will not need more than 15 days to conduct the elections. As far as voters are concerned, they can seek inclusion of their names in the voters’ lists till when the poll notification is issued,” he said.